I hope everyone had a wonderful Christmas, surrounded by the ones you love. Our Christmas was very fun. I love seeing the children open their gifts. There was wrapping paper everywhere and it took forever to open every gift. I still make the kids open them one at a time. I want to be sure to see each child open their gifts. I just love every minute of it. I'm in good health thanks to my check up by Doc McStuffins. Lalaloopsy dolls are too cute. I really want to get them all....for me not my daughter. I need a pad lock on my shoe closet....these teenage girls borrow everything. and there is no greater joy then being a mother. Although Christmas is pretty much over, I still have a Santa tutorial so I'm gonna share it anyway. I've been doing a lot of repurposing of cutters lately. For Santa I used this paisley cutter from Ecrandal. 1. 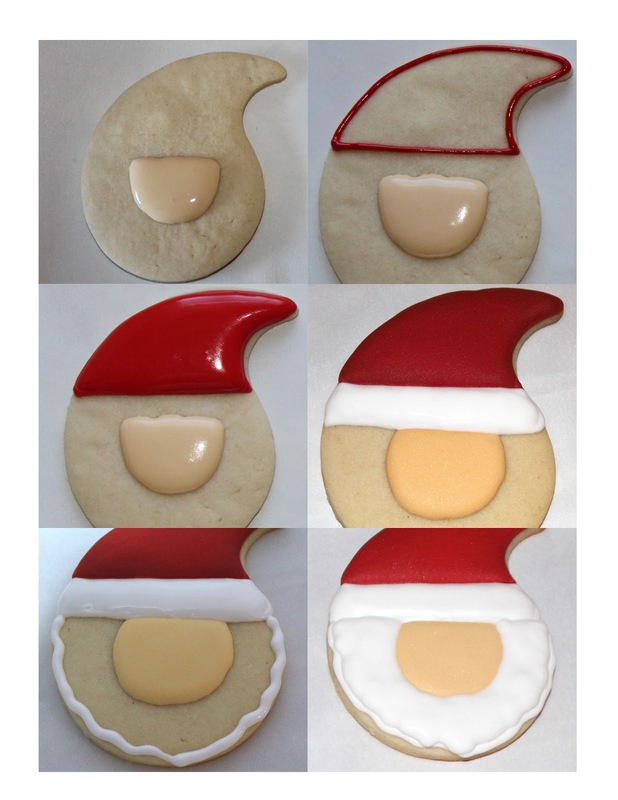 With flesh colored royal icing make a face shape in center of cookie. 2. Outline hat shape in red royal icing. 3. Fill hat with flood consistency royal icing. Let dry. 4. Outline and fill white area on hat. 5. 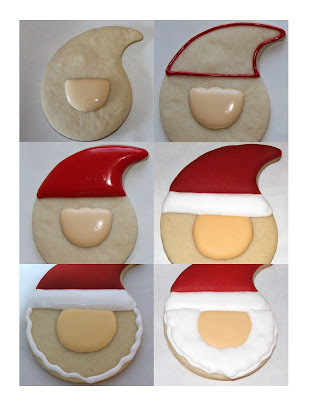 Outline Santa's beard with white piping icing. 8. 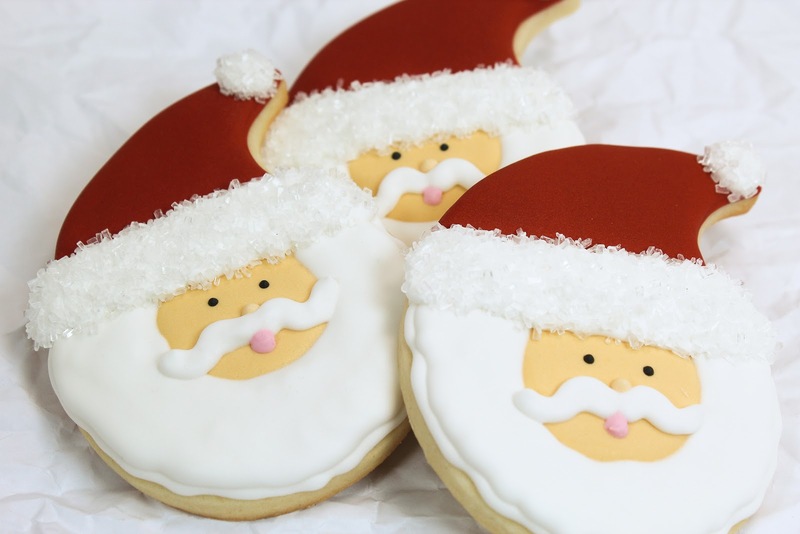 Add Santa's mustache and a pink dot for mouth. 10. While icing is still wet pour white sanding sugar on puff. Shake off excess. 11. With 15 second icing add more white icing to brim of hat. 12. 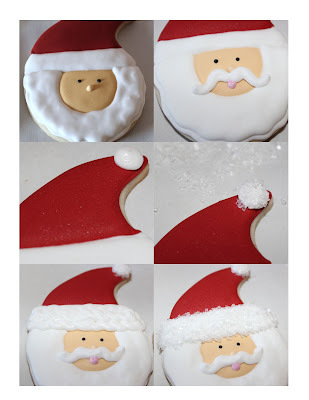 While icing is still wet sprinkle with sanding sugar and shake off excess. Let cookie dry.